Sociologists often argue that the primary factor which determines a person’s religion is where in the world that person is born. If they are born in the Middle East, they will likely be Muslim. If they are born in India, they will likely be Hindu. If they are born in China, they will likely be Buddhist. If they are born in the West, they have a good chance of being Christian. In this month’s Synchroblog, we want to give you the chance to choose a different religion than the one you are currently part of. You don’t have to convert or anything, but we want you to consider that if you could change to any other religion in the world, which would you choose and why? 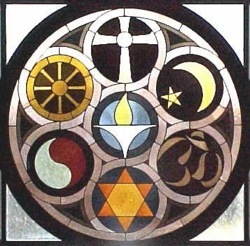 If you do not currently identify yourself with any “religion,” you can still participate. Just pick a religion you have some affinity for, and write about why you chose it. What attracts you to this religion? What are your misgivings about this religion? As part of this religion, what would you think about Christianity? How would your life and your actions be different? How would your values and life goals change? The date of the synchroblog is Tuesday, September 4, 2012. Publish your blog post on that day, and link to it in the comment section here by 10:00 EST. The full link list will go up on Wednesday, September 5 so you can include it back in your own blog post.